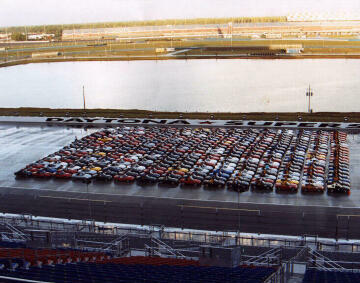 National Miata Club Meeting, Daytona, Florida, Friday and Saturday, 10/22-23/00. Rita and I arrived late Thursday night and went to the Marriott Friday morning to catch the end of the last breakfast. We were amazed at some of the Miata's on hand for the event (see some of the photos on this page,) and how far some members drove to get here with two people in a MX-5 crammed full of luggage. We sat at a table for the closing banquet with Miata Club members from all over the country who drove here one way from Chicago (20 hours), Wisconsin (21 hours), Ohio (17 hours), Memphis (13 hours),and Tampa (5 hours). Rita and I felt lucky to have only driven 4 1/2 hours from Tallahassee for the event. It was amusing to see husbands and wives (or maybe girlfriends) try and get into their two-seaters with a trunk full of luggage and Florida souvenirs for the long trip home. This was trying times for marriages and divorce lawyers. Friday afternoon we took part in a Funcanna autocross on the inside of the Daytona International Speedway. It was awesome to be inside the speedway and driving around on the infield on one of the most famous race tracks in the world. Earlier in the week, they let the Miata's take a two-lap parade lap and a group photo on the main straight. Sorry we missed that one. But the picture (top) is awesome. On Saturday morning, we got up early for another group photo outside the hotel for the Miatas who stayed for the weekend. Then we went on a road rally that went all through Volusia County, including Deland and parts of Daytona Beach I never knew existed. Needless to say, we got lost, but eventually got back on track and ended up at the finish line that afternoon. The ideal mileage was 92 miles--we had 125. Oops, no prize here for us! Saturday night was the final banquet and vendor's fair. About anything you wanted for your Miata could be found inside our meeting room. The keynote speaker was MCA President Vince Tidwell, who announced the 2001 Miata should be out by the first of the year. Vince also said the 2001 convention in Oct. is being planned for Road Atlanta near the national MCA headquarters, where they are trying to attract 1,000 Miatas for the group photo. Hopefully, some of us from Big Bend can go up next year since its only a 5-hour drive there. It was a great event and we had an awesome time. I recommend that every Miata owner should attend at least one of these to help you enjoy your pride and joy!